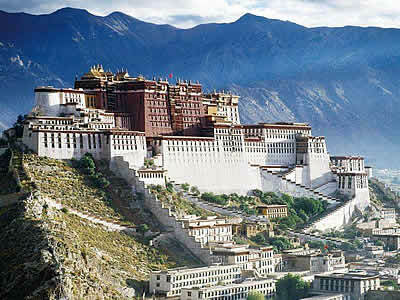 The mild and pleasant climate in central and south Tibet makes this area available for tourists year around. 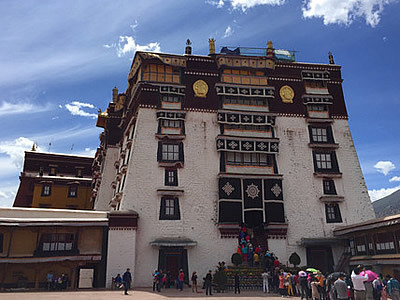 This route offers the epitome of Tibetan Culture with some of the most impressive visions and major cultural sites: snow-capped mountains and holy lakes, splendid monasteries and palaces, the cradle of Tibetan Civilization, original villages and unsophisticated people. 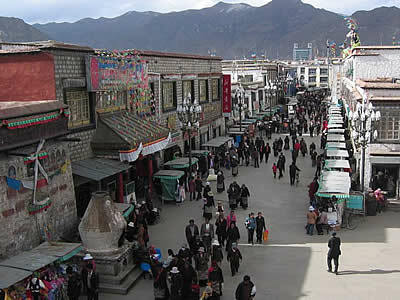 With the better road conditions and nice accommodations along the way, it is now the most popular route for Tibet Tour. 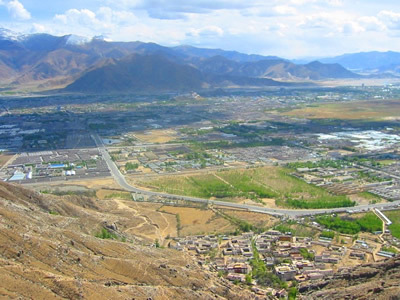 Tsedang, located by the Yarlung Valley to the south of Lhasa, is the capital of Shannan Prefecture. 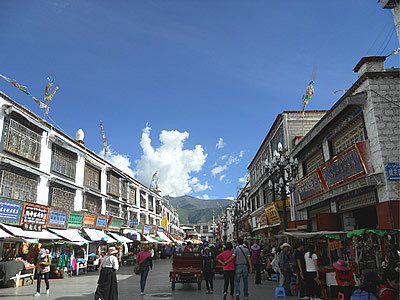 Its reputed as "the cradle of Tibetan Civilization", mainly for two reasons: First, the mild weather and fertile land in Shannan gestated the great Tibet dynasties. 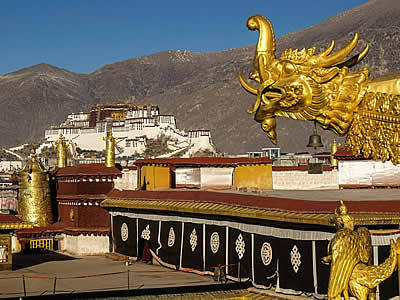 Second, its the birthplace of the first Tibetans who were said to be the offspring of a monkey and a demoness. So Tsedang literally means "monkeys playground". 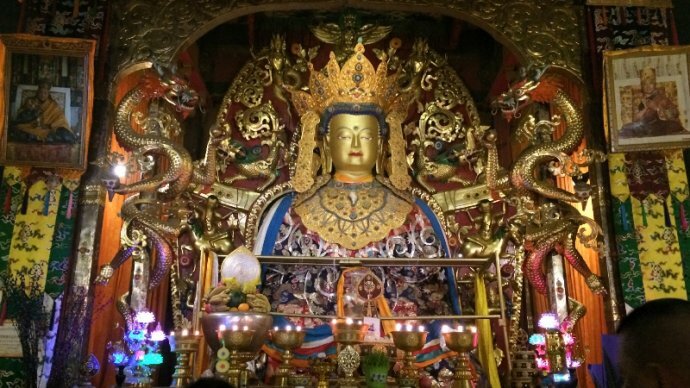 There are several No.1s in Tibet – the first farming land, the first king of Tibet, the first palace (Yhongbulakhang Palace), the first temple in Tibet – Samye Temple. And several kings’ tombs are here. 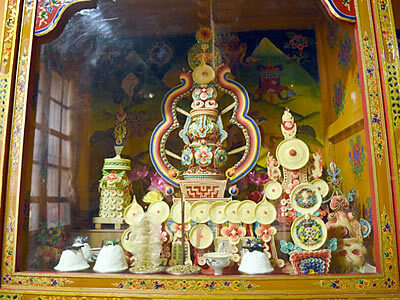 The world’s treasure – Pearl Tangka (a type of painting) was also and is still kept in the Changzhu (Changdrok, Tradruk) Monastery. 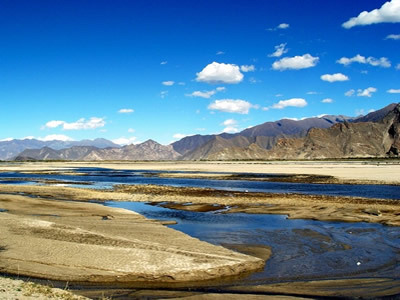 By visiting this legendary area, you can not only explore Tibets origins, but also enjoy the spectacular landscape of Yarlung Tsangpo Valley. 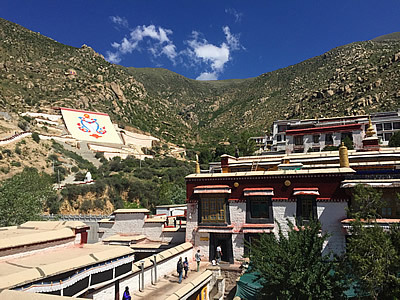 Sera Monasterylies at the foot of a mountain in the northern outskirts of Lhasa. 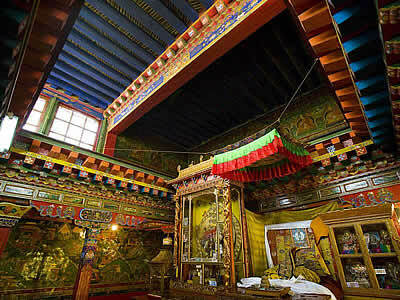 It was founded in 1419 by Jamchen Choje, one of the eight disciples of Tsong Khapa, the founder of Gelugpa Sect, the most important sect of Buddhism in Tibet, covering an area of 114,964 square metres. The structure is imposing, picturesque, and splendid in green and gold. 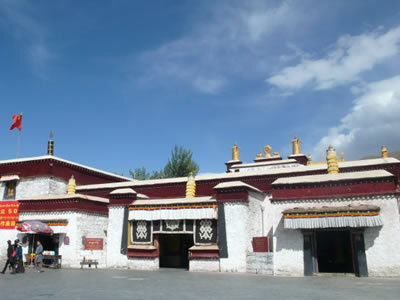 Sera Monastery, together with Ganden Monastery and Drepung Monastery in Lhasa, are reputed as the Three Great Monasteries of Tibet. 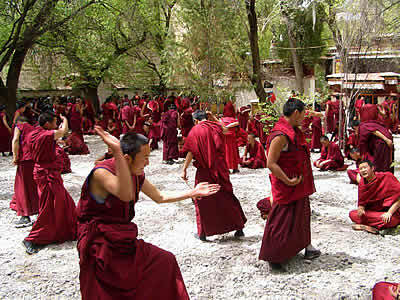 It is very famous for The “Buddhism Scriptures Debating” in the Buddhist Collage in the Monastery. Today’s drive is around 280km / 6 hours. Today in Tsedang, the cradle of Tibetan Civilization, you will visit Changzhu (Changdrok, Tradruk) Monastery and Yhongbulakhang Palace. Built in the 7th century, Changzhu (Changdrok, Tradruk) Monastery is one of the 18 oldest temples in Tibet, as old as the Jokhang temple in Lhasa. It was said that in history the Master, Milariba and Pandhamasangbawa once practiced and meditated here. 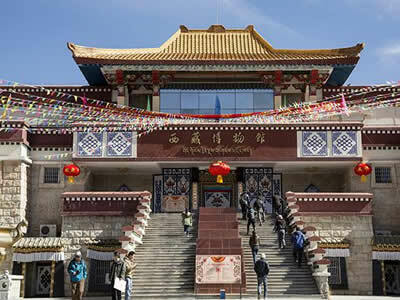 Changzhu Temple is located at the foothill of Mt. Gongri, 2 km to the south of the outskirts of Tsetang (Zetang) Town, just on the main road to Luotsa County. 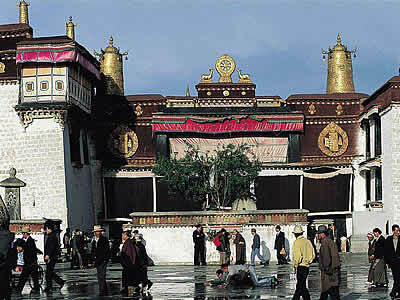 The temple is also the first temple in Tibet for worshipping Buddha during the Turfan time. Legend goes that the master, named Lian Huasheng and Milariba and some other renowned Buddhist eminent monks all led a pious life near the temple before, thus making this area of the temple around the temple still a pilgrimage sacred land. The temple was composed by three parts namely the main hall, the turning of prayer wheel encircling the porch and the porch courtyard. 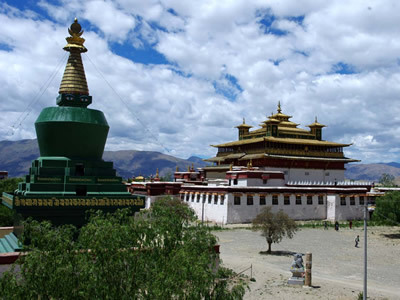 Yungbulakang Palace is the palace for the 1st Tibetan King Niechi in the Yalong River Valley. It is also called "the Mosher and Song Holy Hall". Yungbulakang, built in the second century B.C., stands on the top of a hill on the east bank of the Yalong River in the southeast of Naidong county. The castle can be divided into 2 parts, front and back. The front part is a 3-storey building, while the back part is a castle like tall a building. Enshrined in the shrine is the statues of Thiesung Sangjie Buddha. King Niechi, King Srontsan Gampo and the Tibetan Kings after them. The legend goes that the "mysterious object" was on the roof of the castle, so Buddhists regard here as the holy-land. Today’s drive is around 200km/ 5 hrs. 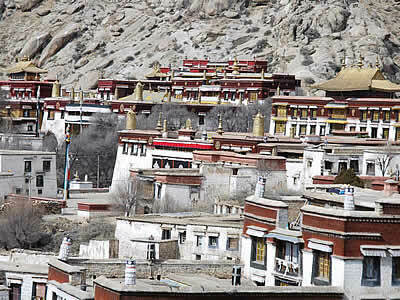 Today in Tsedang area, tourists will visit Samy Monastery and Chenpu Meditation Caves. Located in the quiet piedmont area of the Shannan Region, Samye Monastery is the first temple to be built in Tibet and the first complete temple with the three Buddhist jewels of Buddha, Dharma and Sangha. With these unique features, this splendid temple has become an attraction for visitors from near and far. The temple was built by Trisong Detsen (reigned 742-798) in the Tubo Kingdom and was presided over by the Buddhist master Padmasambhava. The whole construction of the temple is very grandiose and complicated. 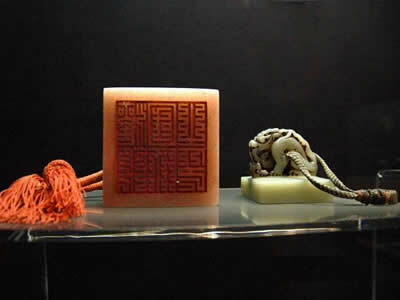 It replicates the universe described in the sutras exactly. 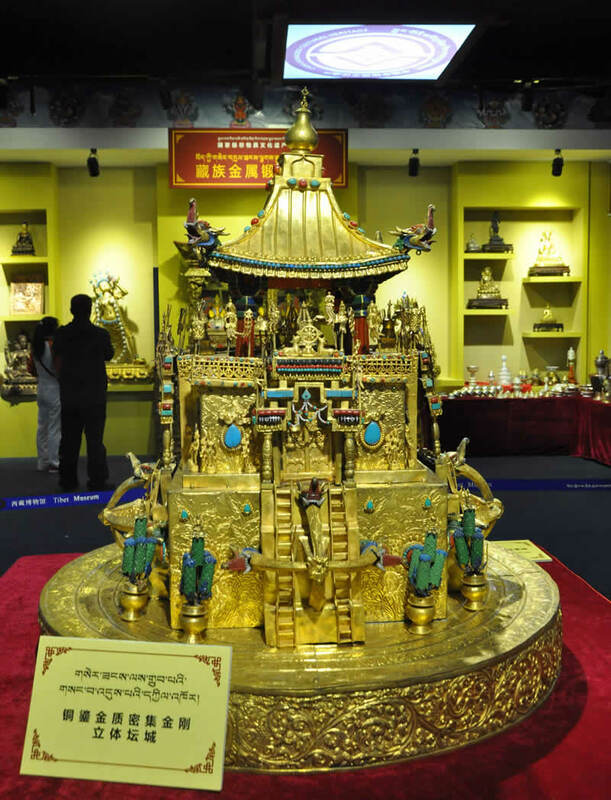 The central world Mount Meru is represented by the majestic Wuzi Hall. The Sun and Moon chapels stand in the north and south as the sun and moon in the universe. Four larger halls and eight smaller halls are distributed around all sides of the central hall, symbolizing the four large continents and eight small ones. In the four corners lie the Red, White, Black and Green Pagodas guarding the Dharma like the Heavenly Kings. A circular wall surrounds the temple as if marking the periphery of the world. The layout of Samye Monastery resembles the Mandala in the Esoteric Buddhism. Located to the north of Samye Monastery, Chenpu Meditation Caves is a dream place for Tibetan Buddhism practicers. 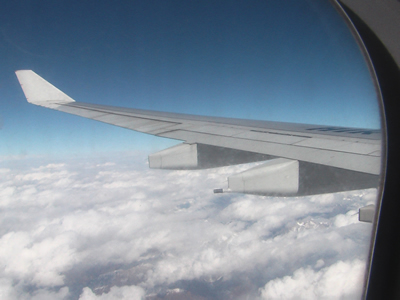 Pack your baggage and say good by to Tibet. 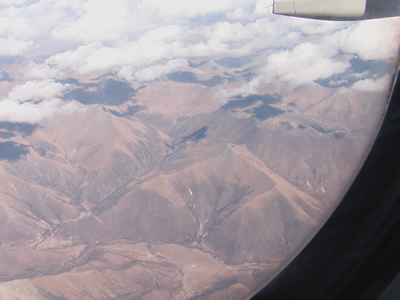 Transfer from Tsedang to the Konggar Airport in Lhasa (110km / 2 hrs drive) for your return flight back to your sweet home.（If you plan to fly to Shanghai, your flight will be via Chengdu or Chongqing or Xi’an.